Home at Last. Is it Spring Yet? 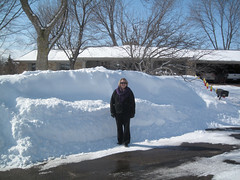 We pulled up into our driveway on March 16. We had begun to see snow patches in the fields around Mason City, Iowa. By Albert Lee, the ground was pretty well covered with snow. 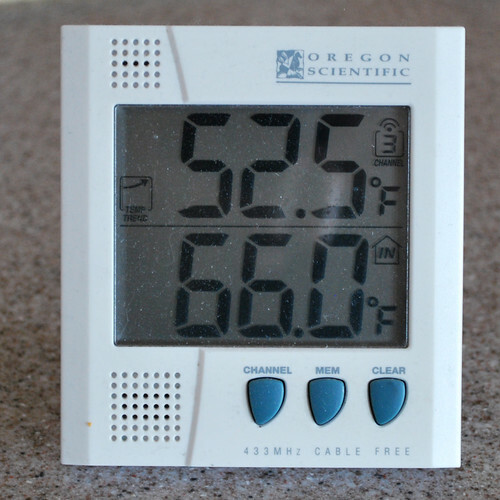 But the thermometer indicated that the snow won't be here long. 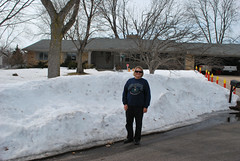 And a quick glance at the snow pile out front shows progress from February 22nd when we left until today, March 17. No, I can't pull the Christmas decorations out of the snow yet. But, I can see most of them! One Last Stop. 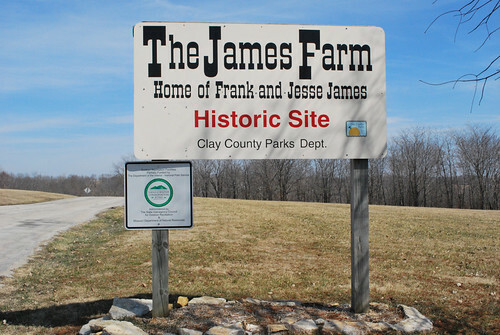 The Jesse James Farm, Kearney Missouri. 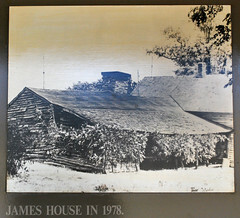 Driving north from Little Rock, we passed through Kansas City, Missouri and saw a sign for the James Farm near Kearney. We turned off the Interstate and headed for the farm. 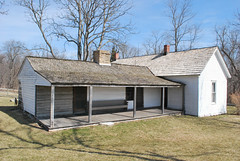 Since we had seen one of Billy the Kid's possible final homes, why not check on Jesse James too? At least there wouldn't be any controversy over who was buried here. That is the original footstone on the grave. 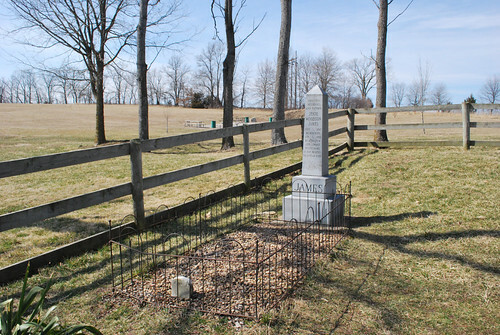 The original headstone had been chipped away by souvenir hunters over the years. There is a nice little museum and with an orientation movie and then a tour of the home. 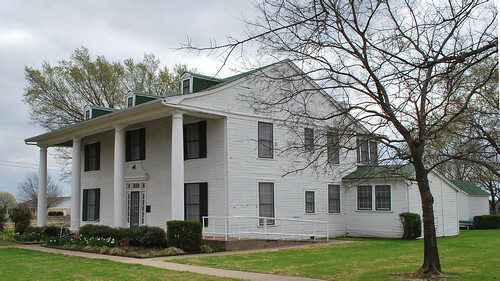 Here, on the left, is a photo of the home as it looked when it was taken over by the county for a museum in 1978. The photo on the right is from today. I couldn't help but think that the original part of the house (the left half of it) was very similar to the homestead that my grandparents lived in up in northern Minnesota back in the early 1900s. It must have made for very long winters to live on a farm a long way from any neighbors. And is it really Jesse James buried in that front yard? 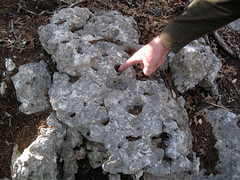 Well, Bison Bill tells us that there is another Jesse James grave located in Granbury, Texas. How did we ever miss that? 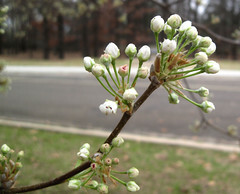 When we first arrived in Texas on February 26, we stopped at the Visitors Center in Texarkana and took a picture of one of the ornamental pear trees that was just budding out. Now, on March 13, we returned to check on progress. 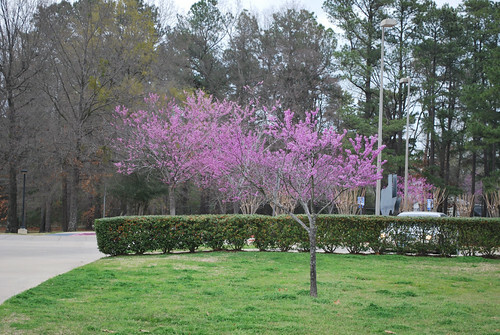 And, in fact, the redbud trees are now the center of the show. The weather has been so nice even here in northern Texas that the local gardens have been planted out in front of the post office. Perhaps the weather will be just as nice back home. 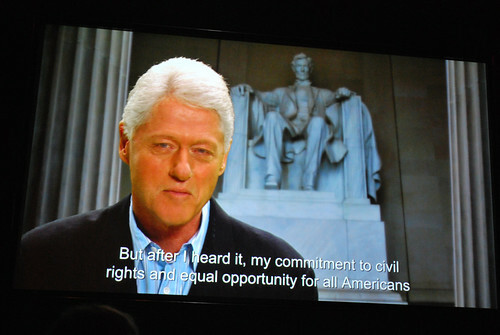 The next morning brought us back to Little Rock to visit the William Jefferson Clinton Presidential Library. 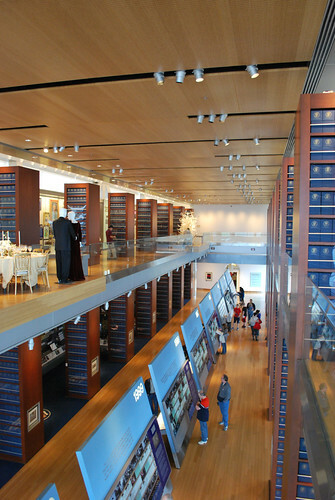 This newest of the presidential libraries brings modern video technology to the table. Yes, finally, a historical site with a 16:9 high-definition presentation! I confess to being spoiled as an HD pioneer. The public exhibits begin with a statistical portrait of the time of the Clinton presidency and a cabinet room exhibit. 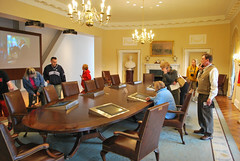 There are similar cabinet room interactive exhibits at several of the presidential museums. 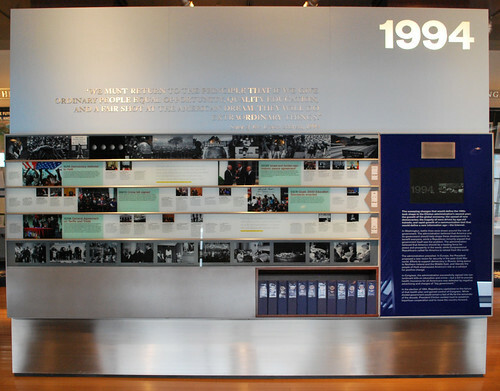 A unique feature of the Clinton Library is this detailed time-line of the presidency. Each year presents highlights and then the binders in the lower right corner show the detailed presidential schedule for each day of the year. There is a binder for each month. This should prove interesting for children born during these years. 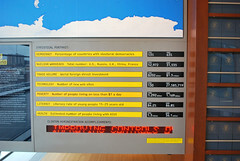 This view from the top level shows visitors scanning the time-line exhibits. All of the blue boxes contain presidential papers that have been processed through the National Archives and into the library. About 5% of Clinton's documents have been handled this way so far. 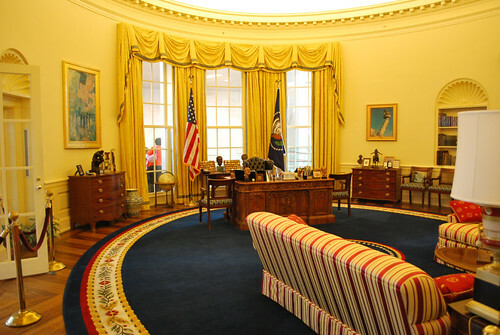 And one of the most popular exhibits at any Presidential Museum is the Oval Office, reproduced as it was during that president's time in office. 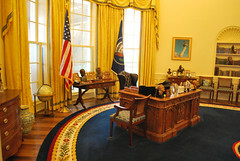 This one includes a nice description of the origins of the Resolute Desk that Clinton used. 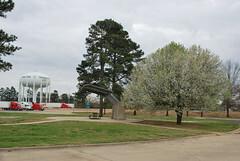 Our next destination was Little Rock where we had missed touring the Clinton Presidential Library on our way down. 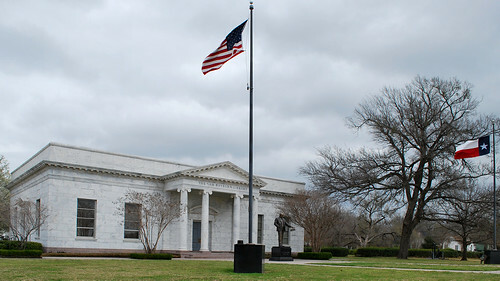 Our most interesting driving route would take us around the Dallas-Fort Worth area and across the northern part of Texas where Linda had spotted the birthplace of Dwight Eisenhower in Denison. That sounded fine to me since Denison also held a Pillsbury refrigerated dough plant that I knew of from my early career at that company (1972-86). For years, scheduling could only be done by only one person, someone with over fifteen years of experience. ...But it (the schedule) was never right. All we did was handle complaints." General Mills obviously found one way to solve the scheduling problem! 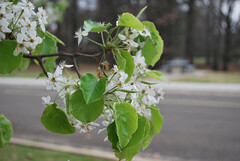 The plant was later sold to Ruiz Foods. The 243 hard to schedule jobs are now replaced by 650 new jobs. Perhaps everyone came out ahead. After arriving in Denison, we looked for a barbecue restaurant to have a final taste of Texas babrecue and settled on Jones Family Bar-B-Que. 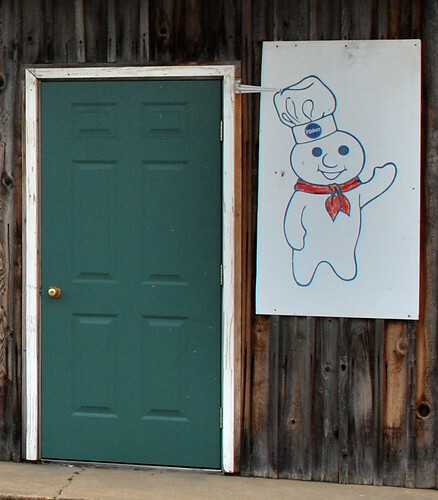 As we pulled up to the restaurant we were greeted by a smiling Pillsbury Doughboy! 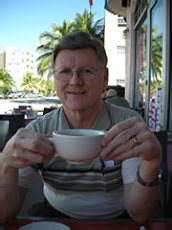 The owner said that they used to do a lot of catering for the Pillsbury plant back in the old days. We found the barbecue to be good with hearty chunks of Texas beef. The next morning we stopped by the Pillsbury/Ruiz plant for a quick look. Then we moved on to the Eisenhower birthplace. 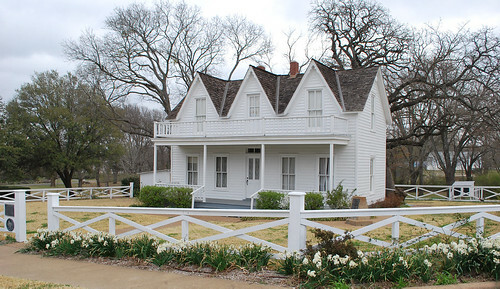 Ike didn't live here long, less than three years before the family moved on to Abilene, Kansas, a town more frequently associated with his boyhood. The home is right next to the railroad tracks where his father worked as a wiper for the Missouri, Kansas and Texas railroad. There is a nice statue of Eisenhower in addition to the home. 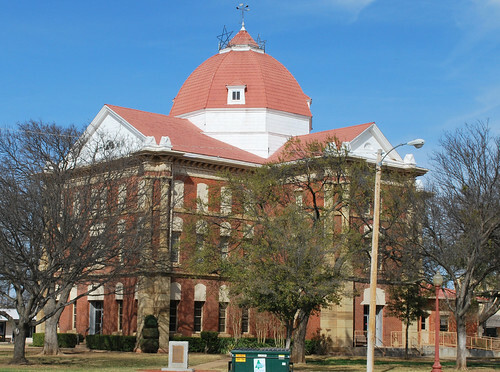 Interestingly, it is only about thirty miles from Denison to Bonham, Texas, which was the home of Sam Rayburn. 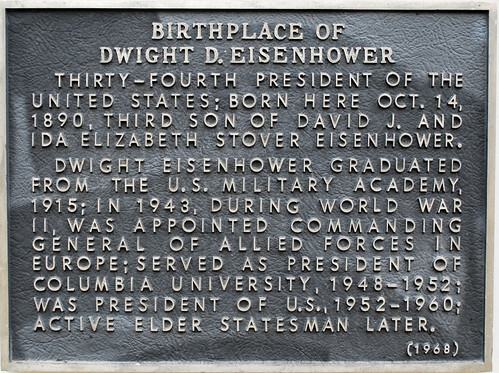 Rayburn served as Speaker of the House or Minority Leader during all of Eisenhower's years as president. 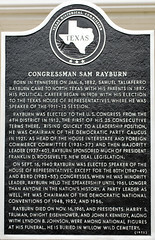 There is a Sam Rayburn library in Bonham in addition to his "home place." 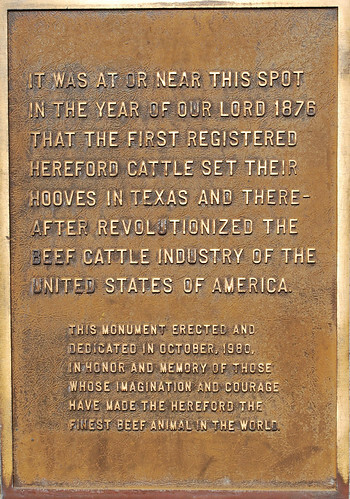 The Real Treasure of Hico, Texas. A National Cash Register. 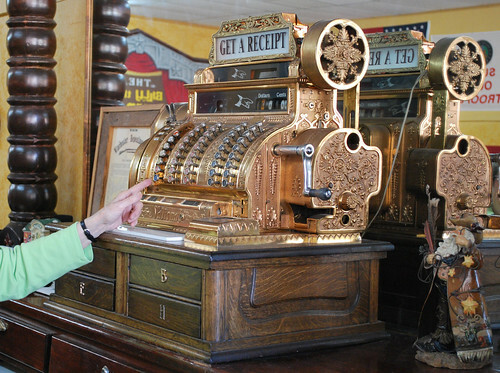 At the end of our tour of the Billy the Kid museum in Hico, our hostess pointed out a large brass cash register on the counter. I'd missed seeing it when we walked in. National Cash Register plays an interesting role in my interest in the history of computers. Thomas Watson, Sr. who was virtually synonymous with IBM through the middle-1950s became a successful salesman working for National Cash Register. He eventually became general sales manager there. The typical IBM biography of Watson describes what happened next along these lines: "Watson had been a top salesman at NCR, but left after clashing with its autocratic leader, John Henry Patterson." 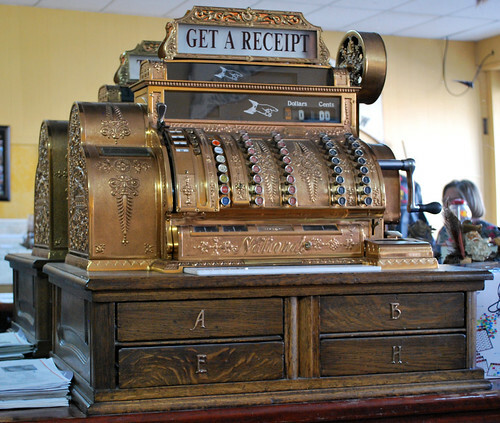 National Cash Register had a virtual monopoly in the manufacturing and sale of its product, which was becoming increasingly popular among American retailers. Unfortunately, the machines were built so solidly that they rarely wore out. Companies selling secondhand cash registers began to steal business from it. You can sense the "solidly built" nature of the machines from these pictures. This is reportedly a 1910 model. That piece of marble at the base of the brass was used to bounce coins, listening for the true ring of a good coin versus the "clunk" of a counterfeit. 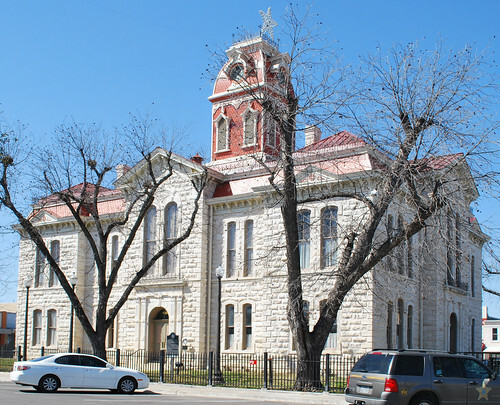 Our trip north from the Texas Hill Country took us along U.S. 281 through Hamilton and Hico. 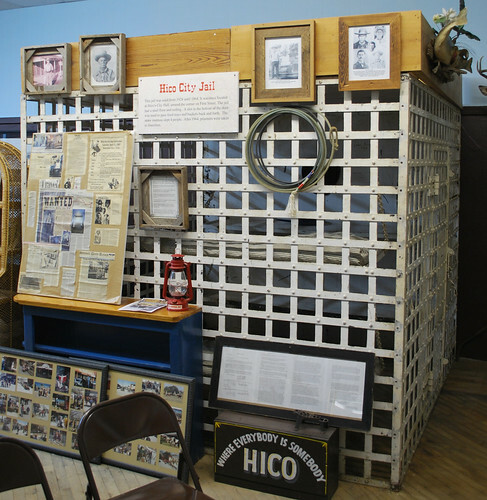 We noticed a small "billy the kid" museum in Hamilton but were headed for a similarly named museum in Hico that was mentioned in the Texas tourism book. 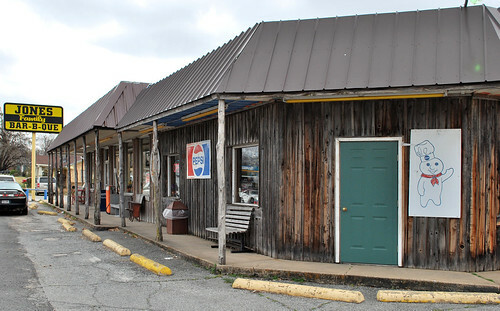 The Hico museum has a video and numerous exhibits centered around the local claimant to the title of Billy the Kid, one Brushy Bill Roberts. Billy the Kid is supposed to have been killed and buried in New Mexico, but there have been several challenges to that story. 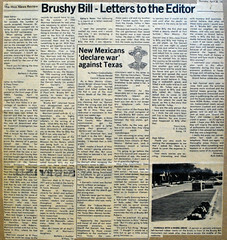 Brushy Bill of Hico appears to be one of the more credible ones. A couple of local newspaper clippings are displayed to support the story. 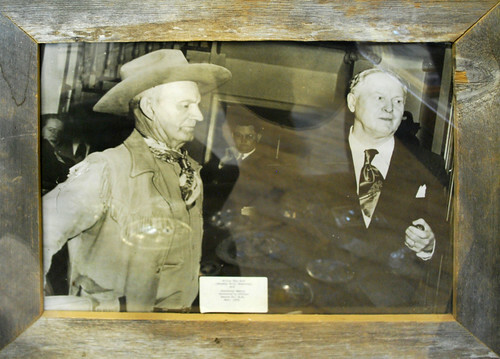 There is a photo of Brushy Bill with the governor of New Mexico from 1950 when Brushy failed to convince the governor of his claim. The museum also has a collection of artifacts from around 1900, one of them being the local jail cell. The best website I found that looks at both sides of the evidence for Billy versus Brushy is this one. I report, you decide. We dipped into the Texas Hill Country long enough to visit a cousin of Linda's in the Austin suburbs. 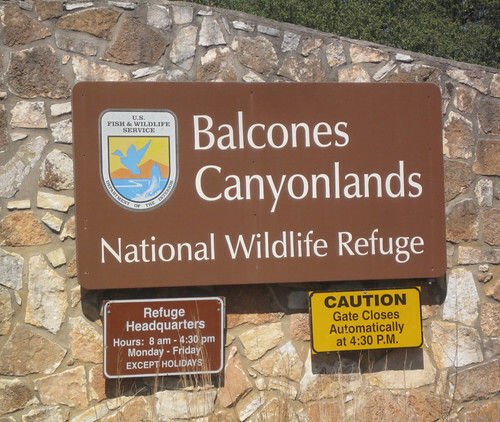 That put us close to the Balcones Canyonlands National Wildlife Refuge, so we stopped in to check the wildlife. A stop at the headquarters gave us some touring information and the ranger said that there had been some sightings of the Golden-cheeked Warbler in the area that day. 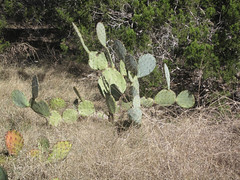 The area offers a variety of rolling countryside with junipers, oaks and prickly-pear cactus. It is the juniper that is home to the golden-cheeked warblers. 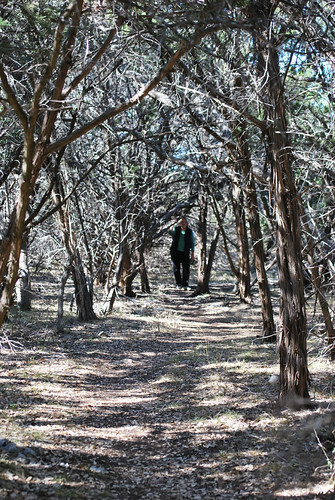 We walked slong a well-marked trail through the junipers. 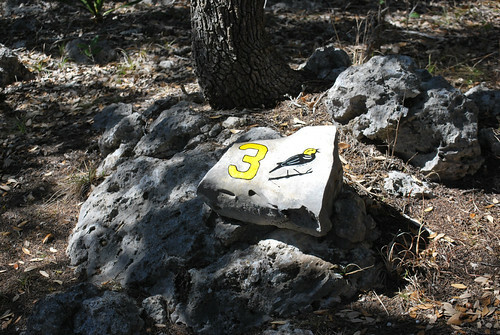 Unfortunately, we never saw a warbler except these that were painted on rocks at observation points. 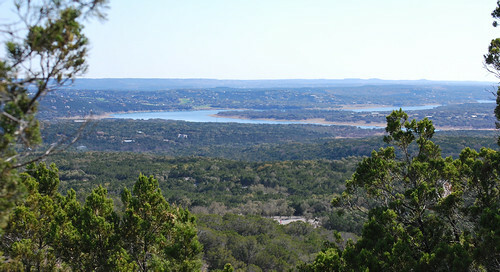 But the views of Lake Travis to the south made the walk worthwhile. 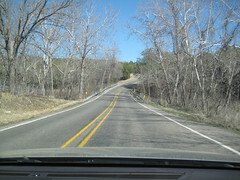 It's pretty easy driving the backroads in Texas since the speed limit is 70 m.p.h. And the scenery in the hill country from Austin north to the Oklahoma border makes it quite worthwhile. We stopped at several county seats along the way and I took a few pictures of the county courthouses. 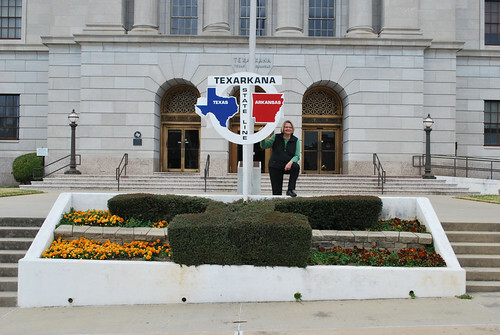 I suppose you could get a pretty good education in Texas History just by driving from seat to seat and reading each of the markers that are located near the courthouses. 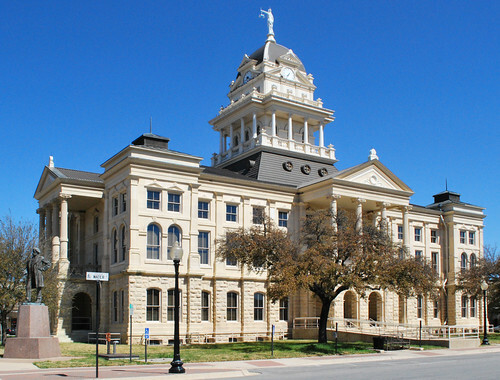 Bell County, County Seat - Belton. That's Peter Hansbough Bell, the 3rd governor of Texas on the left. 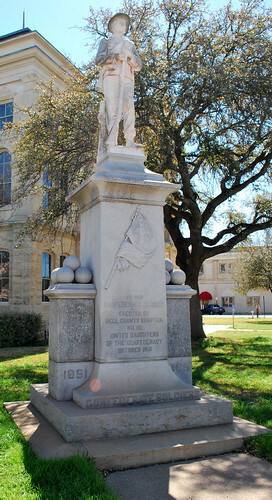 There is a memorial to the Confederate war dead on one corner and on another there is one for the 143 Infantry Regiment from World War II. 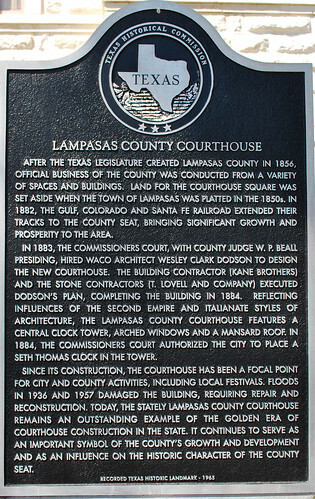 Lampasas County, County Seat - Lampasas. Note the Lone Star on the top. 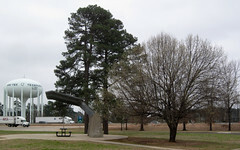 There are several historic markers. One tells the story of the county. Another tells the story of the gunfight at the Lampasas Saloon in January of 1873. Another fills us in on the Horrell-Higgins feud. There are several more! 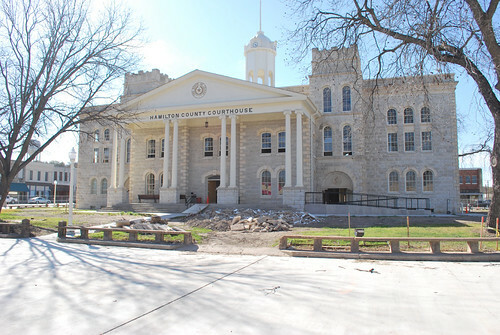 Hamilton County, County Seat - Hamilton. Clay County, County Seat - Henrietta. Obviously, this is cattle country. While you're in some of these towns, be sure to look around for another Texas sign of Texas heritage, the local murals. Here are a couple from Henrietta. Is This a Legal Kolache? Back to Baton Rouge. The State Library.